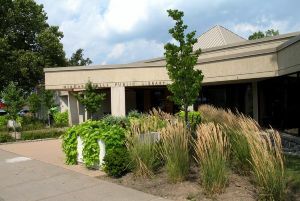 The City of Niagara Falls boasts a contemporary public library system with four libraries visited in person by more than 10,000 people per week and 6,000 visits per week to the library's website and on-line databases. The library system has 5,000 square metres of space, four meeting rooms seating up to 150 people, 300,000 volumes of print and audio-visual resources borrowed annually 600,000 times and a full range of information services including an electronic index of the local newspaper and Historic Niagara Digital Collections. Public access to internet computers and WiFi is available at all four branches. All libraries are accessible for the disabled and accept after-hours return of library books and other materials. Note: Hours of operation are subject to change. For more information call 905-356-8080, email askus@nflibrary.ca, visit us online at the Niagara Falls Library website for further details or stop by any of our locations. Library cards are free for residents and taxpayers of the City of Niagara Falls. Non-residents who own property or a business in Niagara Falls are also eligible for a free card with a tax or water bill from the city. Registering for your free card is easy! Just stop by any of the four Library locations with acceptable proof of address and identification. You can also get the process started from your computer by completing our online new membership application. More than 250,000 books, magazines, newspapers, graphic novels, movies, video games, audiobooks, and music CDs at our four locations. Try out our book club kits, multilingual collections, literacy & ESL materials, and accessible format materials including large print books, audiobooks and Playaways. If we don’t have something you’re looking for we can try to borrow it through our Interlibrary Loan service. Programs for all ages, including early literacy programs for children, after school programs, computer and technology classes, book clubs, film screenings, adult informational programs, genealogy and Ancestry Library Edition instruction, a monthly writers’ circle, a monthly legal clinic, tax clinics, and summer reading clubs. Rich Local History Collections at our Victoria Avenue location and online Historic Niagara Digital Collections, including images, newspapers, art and exhibits. A full service Virtual Library with 24/7 access to downloadable eBooks, audiobooks, and magazines from OverDrive, Zinio and OneClickdigital, as well as online research databases, TumbleBooks, Mango Languages, SELF-e and biblioboard. Reference services and book recommendations in person, by phone and email. Public computers, printers, photocopiers and free Wi-Fi at all our locations. A Visiting Library Service for customers who cannot come to the library themselves due to illness, age or injury. Special services, including laminating, scanning, microfilm scanning, and art photographing (charges may apply). Community displays and art exhibitions in the Rosberg Gallery at Victoria Avenue. Room rentals for meetings, events and programs, including the LaMarsh Room at Victoria Avenue. NovelBranch, a vending machine located at the Gale Centre, stocked with books and DVDs for all ages. The Virtual Sports Wall of Fame is a unique website, developed under a partnership between the Niagara Falls Public Library and the City of Niagara Falls. It permits the browsing and searching of images from the Sports Wall of Fame. This database has an index of the Review newspaper from 1905 to the present (ongoing indexing project); an Image database with over 30,000 historic photographs of Niagara Falls which are fully indexed; the library's catalogue of local history books and materials; and much more.